A dissident comedian serving a 59-year jail sentence in Burma has been moved to a remote jail in the north of the country, his relatives say. 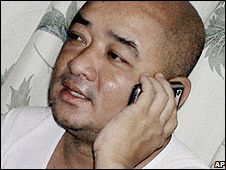 Zarganar is believed to be one of seven dissidents to have been moved from Insein in Rangoon to Kachin State. His family have said the decision is "a cruel act" which will make it difficult for them to visit him. Zarganar had just been named "Journalist of the Year" by a leading media advocacy group. Reporters Without Borders (RSF) said the prize rewarded Zarganar for being "a reliable source of information in a country strangled by censorship and repression". "This is a very cruel act by the government. It will be extremely difficult for the family to make regular prison visits," said Ma Nyein, Zarganar's sister-in-law. The BBC's Burmese Service said Kachin State is a cold and remote region where the military junta sends many of its jailed political opponents. The region can not be reached by road and takes three to four days by train, they said. Zarganar was jailed in November as part of a judicial crackdown on Burma's pro-democracy movement following last year's political unrest. He had been detained earlier in the year for criticising the government's slow response to Cyclone Nargis in interviews with foreign news groups and for organising aid deliveries himself.